C’est l’histoire de jeunes du township qui découvrent les joies du surf. On est en 1989, en plein milieu d’un conflit entre deux groupes politiques à Lamontville. Quand le jeune Otelo Buthelezi, âgé de 16 ans, prend la planche pour la première fois, il est clair qu’il est fait pour le surf. Mais la tragédie rôde. Le jour de la libération de Nelson Mandela de prison, Otelo est forcé de choisir entre le succès au surf et la justice. Durée : 1h30 min. 0 sec. Tourné à Durban en caméra RED et D5 et réalisé par Sara Blecher qui avait précedemment signé SURFING SOWETO en 2010. Somewhere between City of God and Blue Crush, Otelo Burning is a coming of age story set against the backdrop of Nelson Mandela’s release from prison. It’s an emotional story of kids in the township learning to surf. It’s a story of the explosive potential for change at the time of apartheid’s end – all seen through a child’s eye. Shot in Durban and directed by Sara Blecher (SURFING SOWETO), the film tells the story of a group of township kids who discover the joy of surfing. It’s set in 1989, against a backdrop of brewing conflict between two political groups in Lamontville. It is 1989 and the struggle against apartheid has reached its peak. The story starts when 16 year old Otelo Buthelezi, his younger brother Ntwe and his best friend New Year are invited to the beach-house where their new friend’s mother is a domestic worker. They watch Mandla Modise surf and he takes the boys into a world previously closed to them. It is exactly the opposite of the township where they live – a place under a constant and growing threat from political violence fuelled by Inkatha hostel dwellers on one side, and United Democratic Front comrades on the other. For the boys, who previously had a deep-seated fear of the sea, « flying on water » comes to represent freedom, and they are sold. 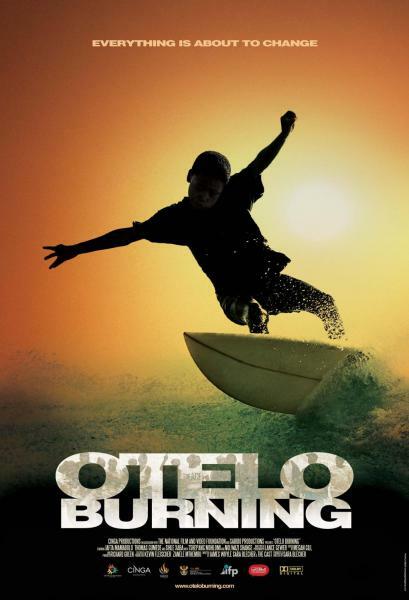 Soon, everyone recognises that Otelo is truly gifted on the water, a surfing star in the making. An older white man, Kurt Struely, approaches the boys, certain of their potential. He invites them to his home to watch some professional surfers on video. He also paints an enticing picture of the life they could have if they learn to master the waves. With practice, Otelo soon outshines his friend, Mandla, whose resentment builds even more when Dezi, New Year’s younger sister, falls for Otelo. As the boys begin to win competitions, Mandla’s jealousy grows and eventually he betrays his friend. In exchange for money for a new surfboard, he sells Otelo’s brother out as a suspected informer for the apartheid security police. When Otelo discovers the truth behind his younger brother’s death, he has to make a choice between the money, glamour, girls and superstardom of international surfing and justice for Ntwe. On the day Nelson Mandela steps out of prison for the first time in 27 years, the young boy makes a choice that will change his life forever. Otelo Burning is the opening film for the 32nd Durban International Film Festival. The film is directed by Sara Blecher and is in Zulu with English subtitles. It stars Jafta Mamabolo (Generations), Thomas Gumede (A Place Called Home), and Tshepang Mohlomi (Izulu Lami). Run Time: 90 min. 0 sec. buildings, events or products is intended or should be inferred. Copyright: 2011 All rights reserved.